There are times when we would like to take the opinion of others. It indeed can be a hassle to individually message each one for their thought. Instead how about taking the help of a social media platform like Snapchat to create polls, which will not only help you reach out to your social circle quickly but also add some fun element to it? 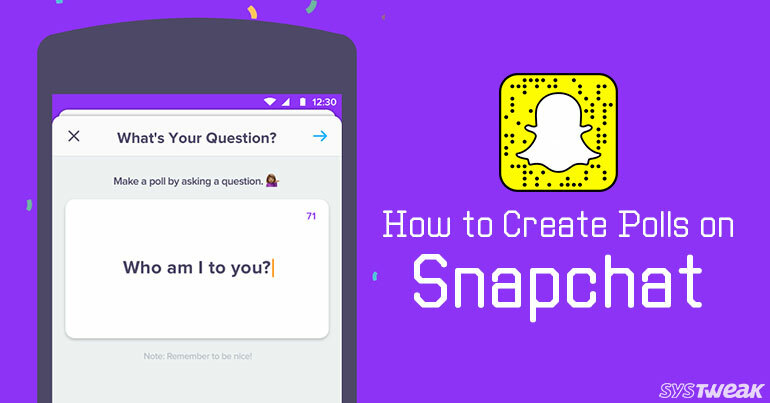 In this article, we will share with you, how to create a poll on Snapchat using Polly app. Download and install Polly app from the Google Play Store or from the App Store. It is a free application. Once you have downloaded and installed the application, you can click on the + icon given on the top right to create a new Poll. You can type your own question or just tap on the dice to get a random question. While creating a Poll you can also change the background color. The best thing about Polly app is that you can create more than three options and you can also turn a poll into a quiz by choosing the correct option. After setting up the question and options you can now post your Poll on Snapchat. In the next step, you will see share icon to copy the link. Once you have copied the link you can tap on the Snapchat icon. It will directly take you to the application. On Snapchat app capture a snap or upload from the gallery or camera roll. On the snap, tap on the paper clip icon to add the link. Now paste the poll link which you have copied from Polly app and tap on Attach to Snap. Make any other edits to your snap if required before you finally post the story. Your poll will be live on snapchat. You can view the results of your Poll by tapping on View Results in Polly app. That’s it! Now your Snapchat followers can express their opinion on your Polls. We hope you will now be able to use this App to create fun polls and quizzes. How To Uninstall In-Built Apps In Windows 10?